Of the unique submissions received on the Carbon Zero Bill consultation 42% did not support a target of net zero emissions across all gases by 2050. Predominantly it was the options to remove biological livestock gases from the bill that were favoured by this group. “It will take time for the narrative and public understanding to change after decades of misinformation about methane from the Government and environmental groups. Of the 12444 long submissions received only 24% or less than 3000 were real and unique. These are the submissions where the submitter has put some thought in to their submission rather than send off a form that someone else completed. In effect Greenpeace’s one submission was just submitted 5350 times. Generation Zero’s submission was also repeatedly submitted a few thousand times. The 9500 form submissions were in fact just 8 submissions and should be treated as such. . It is understandable that most people would select option 3 despite there being no scientist in the world calling for that option, because they would not know that, given the media’s stance. It is heartening that 42% of submitters were informed enough not to choose it. It is not helpful to have Farmers Weekly and other media reporting there was little support among submitters to exclude methane, which is not a fair representation of things at all. Media reports that 91% of submissions called for net zero across all gases are false. More fake news. They based this on reading the forward by Secretary for the Environment Vicky Robertson which was misleading. Robertson has form for telling porkies and any media who actually read any of her reports (including this one) in full would realise that. Farmers Weekly also did not distinguish between the form submissions and the unique ones when making that judgement and in fact did not even report that 9500 of the 12444 long submissions were in fact just 8 submissions sent in by multiple people. This is a significant omission. Most of the 9500 form submissions came from Greenpeace ( 5350) and were predictable but Generation Zero’s submission which was sent in 3359 times called for both a reduction of all gases to zero and also for CO2 to reduce to below zero and for methane to stabilise. So their submission was contradictory and as such impossible. They effectively called for options 2 and 3 and because they are contradictory their submission should have been left out of the count or added to both sides. The Ministry for Environment only counted it for calling for net zero across all gases and as a consequence has misled us all. So either by counting Gen Zero’s submission correctly or ignoring it or by focusing on unique submissions only support for the separate treatment of methane is in the 30 to 40% bracket and that is very encouraging considering the decades of misinformation we have had on methane. “The Ministry for Environment’s consultation document also contained some ambiguity which did not help, with option two and three described as being the same. Option 2. 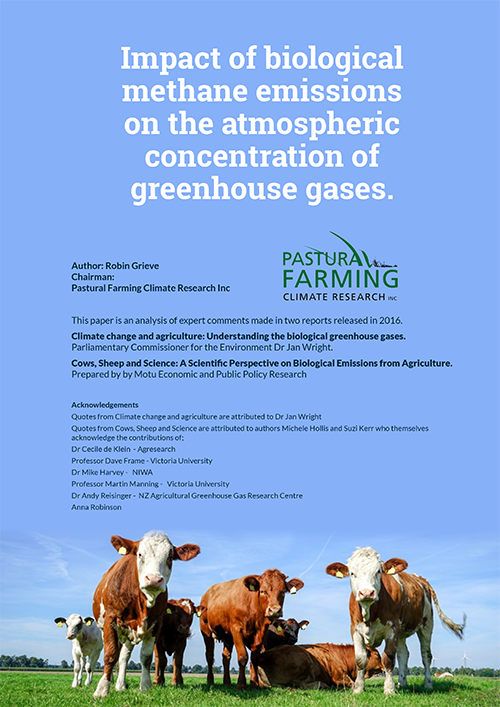 Reducing long-lived greenhouse gas emissions to zero and stabilising our short-lived gases, which would mean our domestic emissions would not contribute to any further increase in global temperatures. Option 3 Reducing all greenhouse gas emissions to net zero, which would mean our domestic emissions would have no impact on the climate from that point forward. “The Ministry only adds to the confusion around methane when it can’t even be clear in its own consultation document. “It is however a great start that the Ministry for the Environment at least now acknowledges its past mistakes in its characterization of methane and did provide the option to remove methane from the Bill. The support for this option is pleasing and shows we are making progress. “There is growing acceptance that what to do about methane needs to involve science and this should mean the right thing is done and option 3 is not chosen. There is not a scientist in the world calling for methane emissions to be reduced in the same way CO2 are, which is effectively what option 3 involves. “Option two can justifiably be described as achieving net zero emissions for all gases in any case because not contributing to any further increase in global temperatures is the ultimate test and definition of a net zero emission.